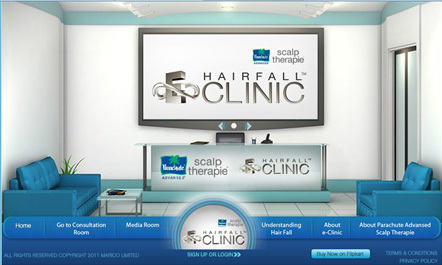 Hair Fall e-Clinic from Marico’s Parachute Scalp Therapie is a fantastic and original idea coupled with impressive execution. The site uses high quality videos and comprehensive content to create a credible platform for online hair fall consultation. The website starts out with an introductory video from celebrity endorser Chitrangada Singh which leads users to register on the site, a process I don’t believe in, unless it adds some discernible value. But in this case, registration helps identify users for consultation and for regime related reminders. Post registration, users need to answer a questionnaire that helps identify specific issues behind their hair problems. The questions are not the usual/expected and are interspersed with video bytes from the resident dermatologist. Once the questions have been answered, a consultation video provides users with details on their condition, suggested hair care regimen, diet & lifestyle tips etc. Users can also download the consultation video and provide feedback and set reminders for their next session. The site also has basic content around hair fall, the product and a link to buy Parachute Scalp Therapie on Flipkart. This one is not just another random brand website. A lot of thought seems to have gone into putting the site together and bringing in required elements, right from idea to design and content. The execution is excellent. Unfortunately I haven't seen this site promoted enough. I hope Marico looks at a media burst around this initiative. Thank you ‘Johny Wen' for the site tip-off.